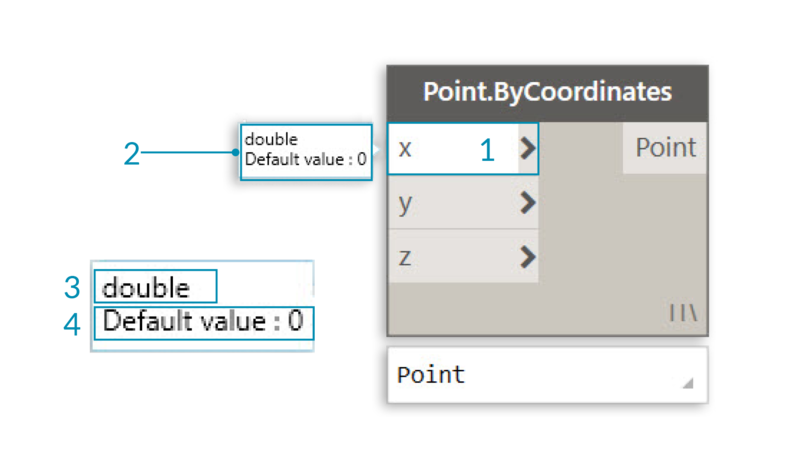 In Dynamo, Nodes are the objects you connect to form a Visual Program. Each Node performs an operation - sometimes that may be as simple as storing a number or it may be a more complex action such as creating or querying geometry. Default Value - Right-click on an input Port - some Nodes have default values that can be used or not used. The Inputs and Outputs for Nodes are called Ports and act as the receptors for Wires. Data comes into the Node through Ports on the left and flows out of the Node after it has executed its operation on the right. Ports expect to receive data of a certain type. For instance, connecting a number such as 2.75 to the Ports on a Point By Coordinates Node will successfully result in creating a Point; however, if we supply "Red" to the same Port it will result in an error. Tip: Hover over a Port to see a tooltip containing the data type expected. Dynamo gives an indication of the state of the execution of your Visual Program by rendering Nodes with different color schemes based on each Node&apos;s status. Furthermore, hovering or right-clicking over the Name or Ports presents additional information and options. If your Visual Program contains warning or errors, Dynamo will provide additional information about the problem. Any Node that is Yellow will also have a tooltip above the Name. Hover your mouse over the tooltip to expand it. Tip: With this tooltip information in hand, examine the upstream Nodes to see if the data type or data structure required is in error.